Celebrated animation/comedy filmmakers Phil Lord and Christopher Miller return to the toy construction world again as co-writers and producers for their much ballyhooed Warner Animation follow-up. 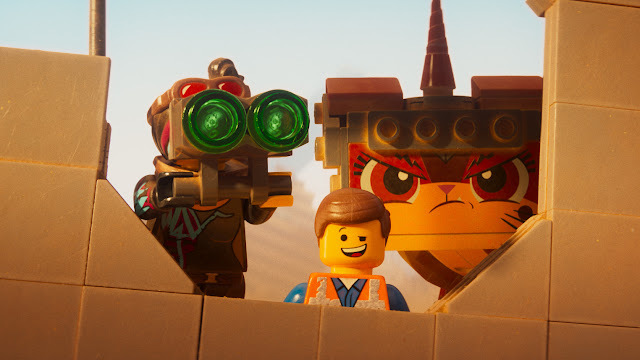 The Lego Movie 2: The Second Part isn't as awesome but is a perfectly suitable super-sequel to their surprisingly inventive original The Lego Movie. Mike Mitchell takes over directorial duties but Lord and Miller's fingerprints and trademark sense of comedic animation are all over the picture with their strong scriptwriting skills at work. How he and his team of animators continue to visualize the imaginative world of playing toys continues to impress. The Second Part largely revolves around the theme of sharing and issues of toxic masculinity as projected onto children at a young age as a result of skewed gender roles and stereotypes. While not as inventive as the first film's sense of originality or imagination, the sequel mostly lives up and extends the toy's appeal as a storytelling device. This time around, Chris Pratt—as both Emmet and his doppelgänger Rex Dangervest—riffs on his current affable action guy role by way of Kurt Russell in films like Guardians of the Galaxy and Jurassic World. He's rejoined by both Elizabeth Banks and Will Arnett as Wildstyle/Lucy and Batman again to build more fun and taking off where the last film left off. Lucy gets more to do as the producers have amped up more "girl stuff" after promising and delivering a more female-forward narrative. The original cast is joined by shapeshifting Queen Watevra Wa'Nabi (Tiffany Haddish) and General Sweet Mayhem (Stephanie Beatriz) as newcomers or "alien invaders" straight from the imagination of a typical little sister (Brooklynn Prince). It's a jumbled but amusing economy of characters, action, and jokes that makes another mark. Mitchell, Lord, and Miller's animated adventures are fully realized with even more catchy musical riffs and well-crafted comical gags. Surprisingly, the closing credits song by The Lonely Island accompanied by a visually impressive animated sequence is simply incredible. The Lego Movie 2 is another crowd-pleasing family film that mines child imagination to replicate its narrative of storytelling and sense play fluidly once again. Its cute and sweet core offer another truly appealing adventure. However, the sequel just doesn't break the same (or different) new ground its predecessor did.